Connection: -This object creates a connection to the database. If you want to do any operation on the database you have to first create a connection object. Command: -This object helps us to execute SQL queries against database. Using command object we can execute select, insert, update and delete SQL command. Data reader: - This provides a recordset which can be browsed only in forward direction. It can only be read but not updated. Data reader is good for large number of records where you want to just browse quickly and display it. Dataset object: -This provides a recordset which can be read back and in forward direction. The recordset can also be updated. Dataset is like a in memory database with tables, rows and fields. 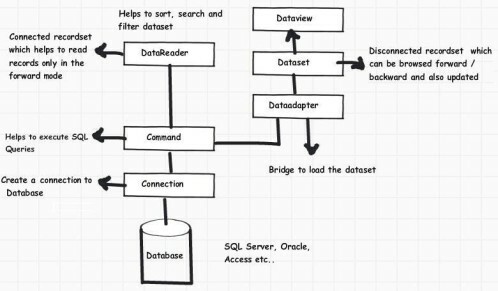 Data Adapter: -This object acts as a bridge between database and dataset; it helps to load the dataset object. Data View: - This object is used to sort and filter data in Data table of dataset. 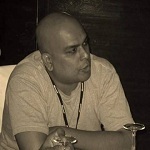 For more on ADO.NET interview questions from author's blog.